Category: Shiromi (white fish) Season: best from late October to early December. Kawahagi is a flat, sand-dwelling fish found in Japan's coastal areas. It reaches a length of 8 to 10 inches, and for a long time was considered a "throwaway" fish by Japanese fishermen. 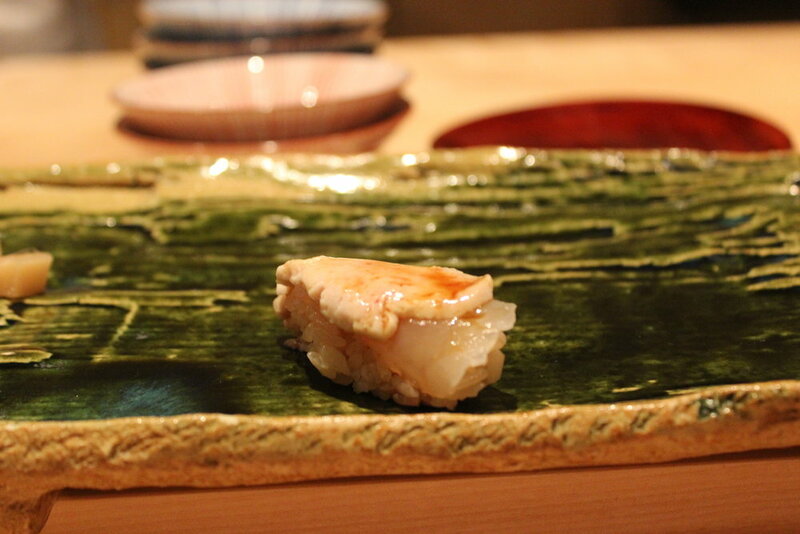 When served as nigiri-zushi, it is usually topped with its own liver, as pictured above. It is a delicious and often very expensive seasonal item that appears in high-end sushi shops from late October until the beginning of December, then disappears from the menu for another year. The taste of the fish itself is quite subtle and delicate, not unlike hirame, but the addition of the liver adds a decadently creamy element to the nigiri, making it an intoxicatingly rich delicacy.